1st Stage of World Cup 2016 – International competition “Portugal-2016” ended. 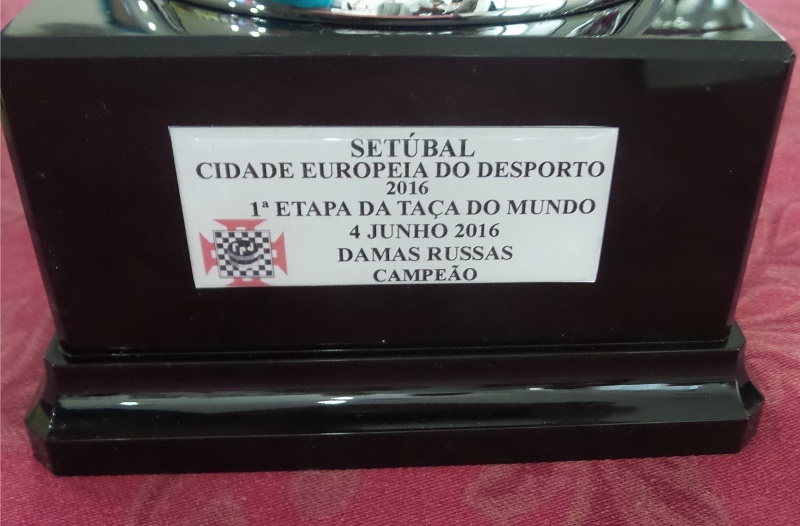 Competitions was held from 28th May (arrival day) till 4th June (departure day) 2016 in Setubal (Portugal), which is European City of Sport 2016. International grandmaster Dmitry Tsinman won Classic program and Blitz. 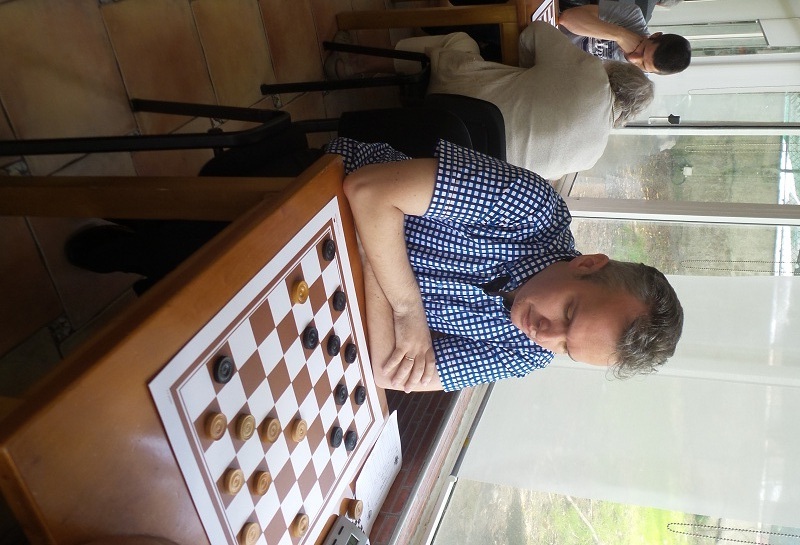 Manuel Tiago won Rapid in Portuguese draughts. 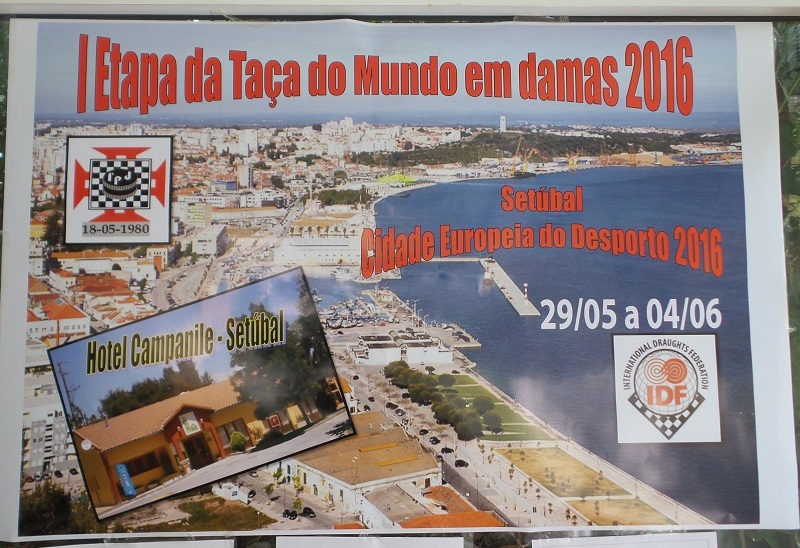 Competitions are held from May 28 (arrival day) till June 4, 2016 (departure day) in Hotel Campanile Setubal, Caravelas street, 2910-279 Setubal, Portugal. Competitions are held in the three types of program: Blitz, Rapid and Classic. 1). 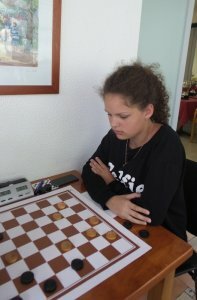 Blitz (Brazilian Draughts) – 7 rounds by Swiss system, micro-matches consist of two games with draw according to the official table, 5min + 3s/move for each game. 2). Rapid (Portuguese Draughts) – 7 rounds by Swiss system, 20min for 2 games total. 3). Classic (Russian Draughts) – 7 rounds by Swiss system, micro-matches consist of two games with draw according to the official table, 20 min + 10s/move for game. As part of the competition International Match: Portugal versus Rest of World in Portuguese Draughts will be played, Portuguese Draughts, 4 games, opening draw, 90 min per player. 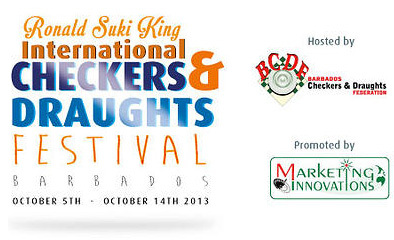 All participants must have medical insurance for the period of the competition. 50 Euro for women, veterans 60+, youth 23 year and younger. Prize fund of the competition is no less than 1500 Euro. 4. All reservations to this hotel are made by the F.P.D. (Portuguese Draughts Federation). 5. The costs of accommodation, meals and travel of participants are paid by their sending organizations or at their own expenses. The costs of accommodation and meals shall be paid to the Portuguese Draughts Federation until May 28/29, 2016 through its NIB / IBAN. In case of impossibility of this transfer, these costs shall be paid to the FPD in cash upon arrival. To Lisbon and back by plane and Lisbon-Setubal/Setubal-Lisbon by bus. Airport – Gare Oriente (Taxi) 5 minutes or bus no. 705 or 208 (ten minutes). The better is the taxi due to luggage. Applications for obtaining visas (up to May 01, 2016) and booking accommodation (up to May 07, 2016) must be submitted to the organizers on e-mail: [email protected]. 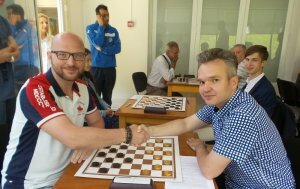 10-06-2016 During the 1st Stage of the World Cup 2016 in Setubal winner of the classical and blitz programs of the 1st Stage of the World Cup, international grandmaster Dmitry Tsinman interviewed the winner of the World Cup 2015, the 8-times champion of Russia Vladimir Skrabov. 05-06-2016 Some participants sent a review of the 1st stage of the World Cup. 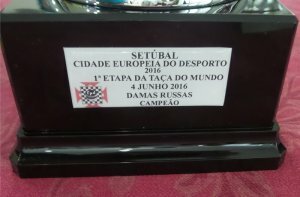 The Portuguese Draughts Federation, whereas all its members without exception, expressed his eternal gratitude to IDF for his contribution in the Organization of the event “1st Stage of World Cup in Draughts-64, Setubal 2016”, which ran without unexpectedness and in an exemplary manner by all the participants of various parts of the world. 03-06-2016 Classical program of the 1st stage of the World Cup is finished. 12 points scored Dmitry Tsinman, who played in the last round in draw with Damir Rysaev and Vladimir Skrabov, who won Andrey Gnelitskiy. The fate of the first place decided by additional criteria, which were better for Dmitry Tsinman. 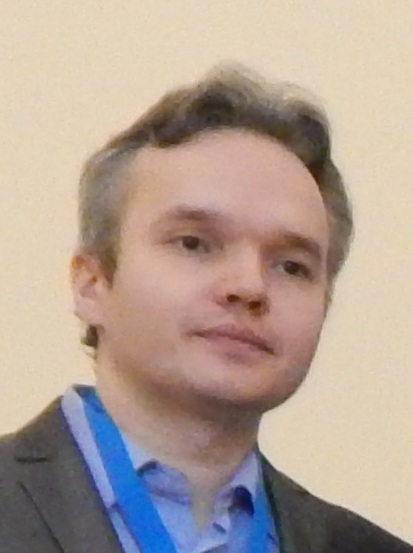 Third place with a score of 10 points took Damir Rysaev. 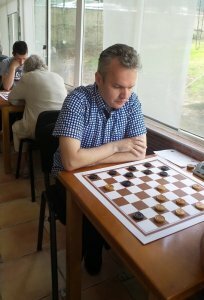 02-06-2016 After 5 rounds of the classical program with a score of 9 points from 10 leading international grandmasters Dmitry Tsinman and Vladimir Scrabov. They made only one draw each other. Damir Rysaev have on one point less. By 7 Points have Andrey Gnelitsky, Oleg Polikarpov and Ekaterina Ivanova. 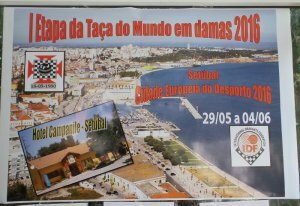 30-05-2016 Rapid in Portuguese Draughts was held today. The competition was held on the Swiss system in 7 rounds. Players played 2 games with each other in the classic draughts without the draw of moves. As expected, the Portuguese players were ahead. 29-05-2016 On the 1st stage of the World Cup 2016 – International competition “Portugal 2016” in the city of Setubal, accepted European City of Sport 2016, arrived 35 participants from Portugal, Russia, Germany, Poland and Angola. Opening of the competition was held today. Participants were welcomed by representatives of of City Hall and of the Municipality of Setúbal. 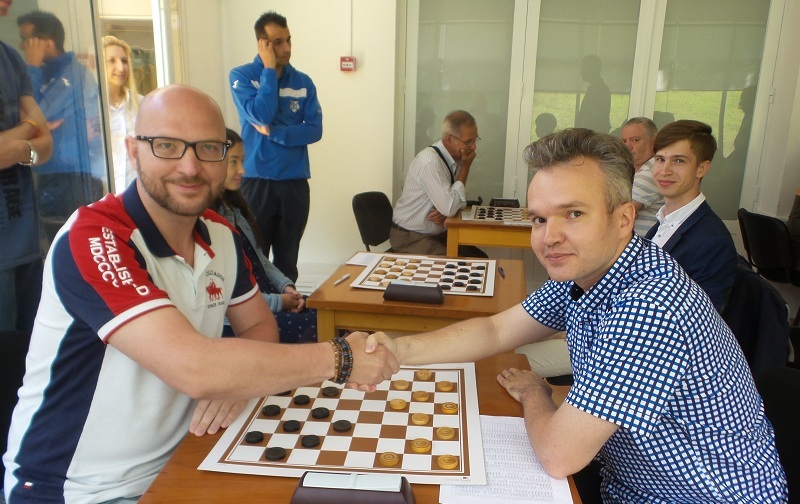 For the world team played international grandmasters Vladimir Skrabov, Dmitry Tsinman (Russia), Gennady Shapiro (Germany); International Masters Ruslan Pescherov, Andrey Gnelitsky, Damir Rysaev and other well-known players. 18-time champion of Portugal, national and international Grand Master Manuel Vaz Vieira was headed Portuguese team. Such match is held for the third time and for the first time world team won with a score of 13 : 11.